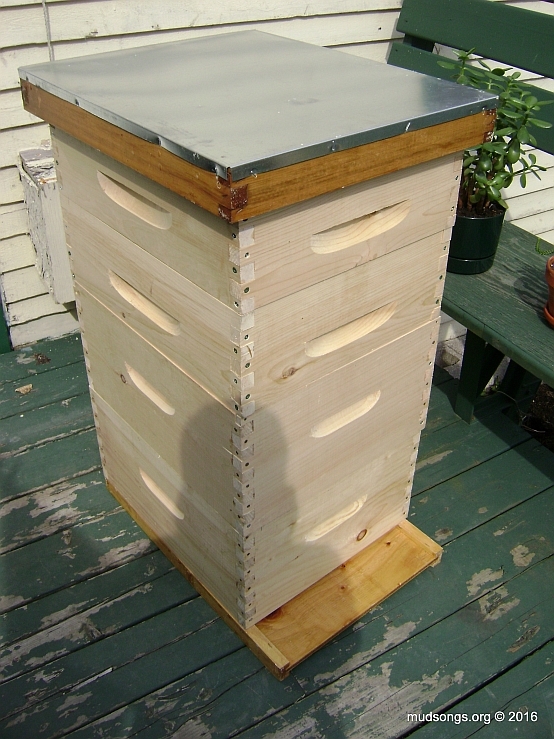 The Langstroth hive, along with other vertical hives of similar design, is basically two big boxes stacked on top of each other with a roof on top, a floor on the bottom and 10 movable frames inside each box. The hive in the above photo happens to have two big boxes on the bottom and two smaller boxes on top. Each box is called a super, short for Super Duper (or superstructure). The large supers on the bottom are called deeps (sometimes referred to as hive bodies) because they’re deeper than all the other supers. They usually make up the main body of the hive where the honey bees live. It’s also known as the brood chamber. The smaller supers on top are called mediums, sometimes referred to as medium honey supers, because they’re medium in size compared to deeps and it’s usually where the bees store their surplus honey (the honey humans get to eat). Some people use an even smaller super called a shallow super for harvesting honey. Supers come in other shapes and sizes, but deeps, mediums and shallows are the most common. A deep super on the left (for brood) and a medium super on the right (for honey). As with most things in beekeeping, the terminology for hive components is inconsistent and all over the place. Most beekeepers don’t refer to deeps as supers like I do because, if you want to get technical (which I don’t), whatever goes on top of the main hive body is considered the superstructure. It’s superfluous, if you want to think of it that way. It’s usually where the surplus honey goes — on top. And that’s where beekeepers get the word super. I refer to all the boxes or chambers of the hive as supers, whether shallows, mediums or deeps, because they’re built exactly the same except at different heights. I know some beekeepers who use deeps as honey supers and never use medium supers. So for them, deeps are booth brood chambers (on the bottom) and honey supers (on the top). I know other beekeepers who use medium supers for everything and never use deeps. So what would usually be called a honey super for most beekeepers is part of the brood chamber for them. And we’re just getting started. If I’m confusing you already, then you get the picture. All you really need to know is that deep supers are big and are usually on to bottom of the hive. They make up the brood chamber, the place where the bees live and make baby bees. Medium supers are smaller than deeps and are usually found above the brood chamber. It’s where the bees store surplus honey. Shallow supers are the same as medium supers, except they’re smaller. Deeps are sometimes called the hive body. Everything else above the hive body is called a honey super, or sometimes just a super. Clear as mud, right? Tools I used to make my first hive. Moving on, most supers come pre-cut with pre-drilled holes for nails or screws. It should be obvious how the pieces fit together and where the screws or nails go in. Some people use glue. Some don’t. Some people use a nail gun. Some use a screw driver or a power drill. It all works. I put my first hive together using a hammer and nails and glue. These days, I don’t use any of it. Glue isn’t necessary. I forgot to use glue for most of the supers I first put together and it didn’t make any difference. I just use a power drill and screws, no glue. A nail gun is probably easier, but I don’t have one. I put my first deep together with nails, but the nails kept cracking the wood, so I used various screws instead and drilled some of the screw holes myself, making sure the holes were wide enough to prevent cracking. Completed deep super or hive body, assembled with nails and glue. I would not want to assemble a super without a power drill or nail gun. I didn’t use a single power tool my first time out, and it nearly killed me. Looking down into the deeps with an empty frame in the bottom box. Some of the joints didn’t fit perfectly, so I had to force them in place with a hammer, literally splintering the wood off to make them fit. This made gluing the pieces more of a mess, so I just gave up on glue. Two completed deeps over a bottom board with two medium supers and a top cover on top. In other words, a completed hive. What else is there to say? 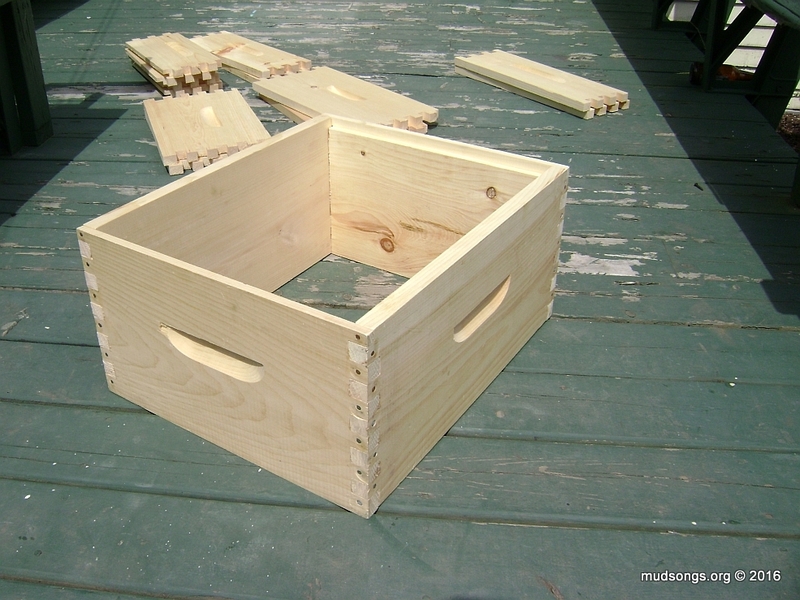 I used to use a carpenter’s square to make sure the boxes were more or less square, but that’s too much unnecessary work. I just bang them together now and eyeball it. The corners still look like 90° corners to me. I’ve picked up supers from different companies and made a few myself over the years, which has left me with a mishmash of supers that don’t fit together with the greatest precision. And it doesn’t really matter. Yes, perfectly sized hive components would be better, but it’s a minor inconvenience that I barely give any thought to. Most backyard beekeepers working within a tight budget usually build up their apiary (a fancy word for a backyard with beehives) one or two hives at a time. You work with what you’ve got. And the bees don’t care. They’d live in a tossed out mini-fridge if that’s all they had. I know this is a rambling post that doesn’t get down to the exact procedure of assembling a hive (or assembling the supers), but it doesn’t need to be exact. The wooden walls of the supers fit together like the simplest 3D puzzle pieces you’ll ever see. They fit together one way and there’s only one place where the nails or screws can go in. If there aren’t any pre-drilled holes for the screws, that’s probably because most pro beekeepers who have all the fancy gear don’t need pre-drilled holes when they’re using a nail gun. So you might have to use a tiny drill bit to make some holes for the screws. Two to three inch screws (5-7cm) are fine. I use brass screws because I can get them cheaply. 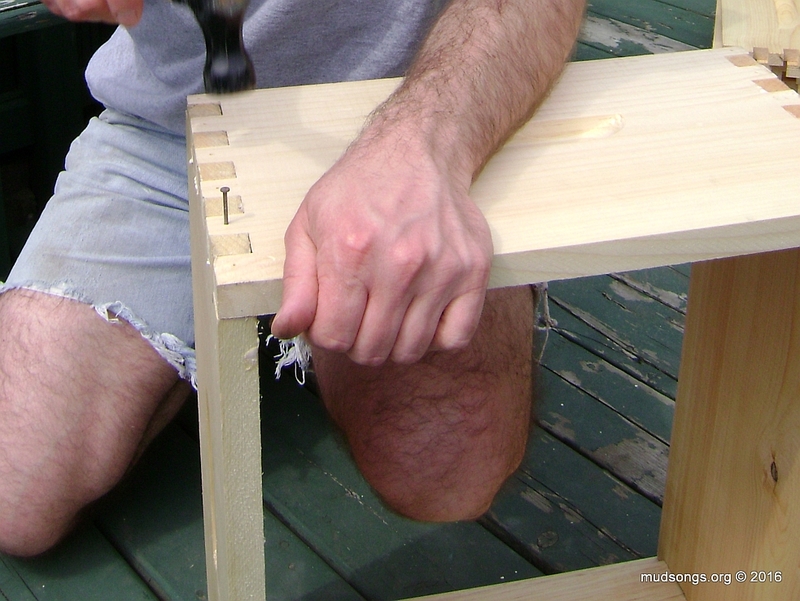 If you don’t have a power drill, grab some nails and a hammer. It makes no difference to the bees. 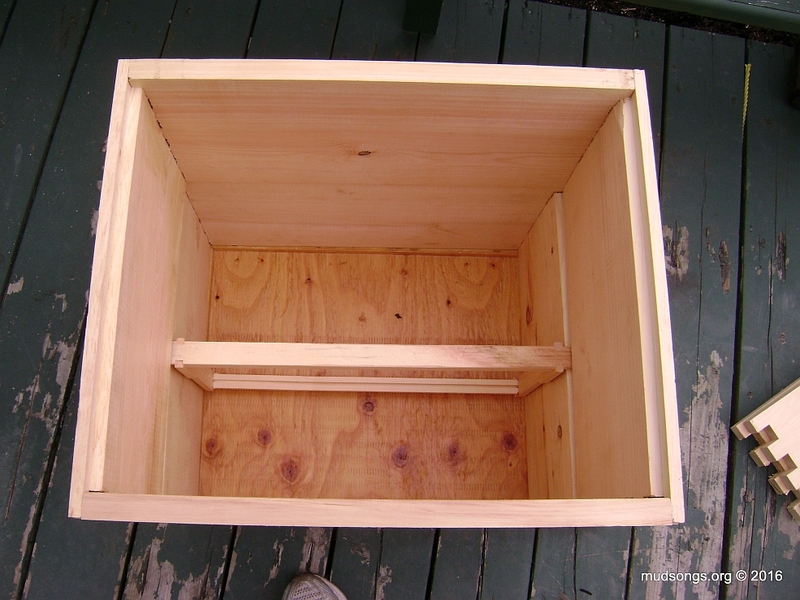 Check out How To Paint Hive Boxes for a demonstration of how I paint hive boxes. 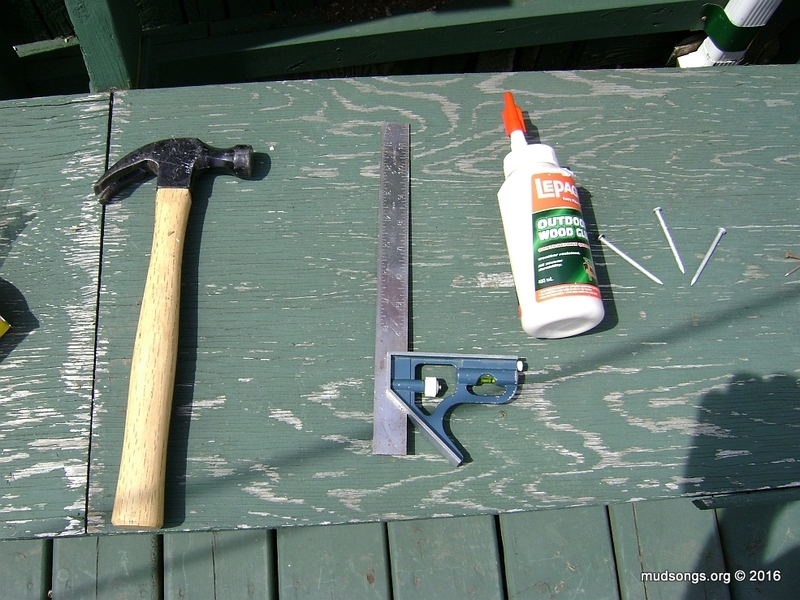 This entry was posted in Building Stuff, Year 2010 and tagged Practical Tips. Bookmark the permalink.